Native to North America, the armyworm can be found east of the Rocky Mountains, reaching northward into southern Canada. Armyworms get their name from their behavior of moving across fields in an army-like fashion. As larvae consume available food sources, they migrate as an army to new host plants. Though they feed primarily on grasses (oats, wheat, fall rye, corn, barley, and forage grasses), they can be a pest of some vegetables (bean, cabbage, carrot, onion, pea, pepper, radish and sweet potato). There are usually two to three generations each year in Illinois. 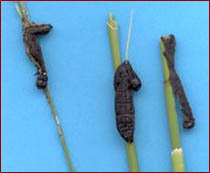 Armyworm larvae vary in color from dark greenish-brown to black. On each side, there are long, pale white, orange, and dark brown stripes along the length of the abdomen. 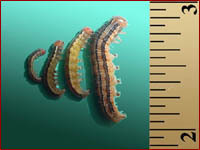 Mature larvae are approximately 1 ½ inches long. The head capsule is yellowish brown with a brown network of veins, giving it a mottled appearance. 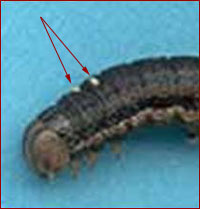 Armyworm larvae may also be distinguished by a dark band on the outer side of each proleg. Armyworm pupa stay in a brown earthen shell just below the soil surface. 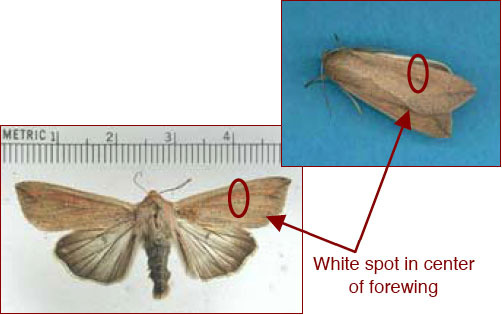 The armyworm moth, approximately an inch long with a 1 ½ inch wingspan, is tan to light brown, with a tiny white spot centered on each forewing. Eggs, which resemble small white globules, are laid in rows or groups on leaves of host plants. After oviposition, the moth rolls the leaf blade of the plant around each egg mass. Few armyworms overwinter in Illinois. Most armyworm moths migrate into the Illinois from the southern states in April and May. During the day, moths remain hidden in grassy vegetation. Armyworm moths are active during the evening, feeding on nectar, mating, and searching for oviposition sites. Eggs are deposited in rows or clusters on thelower leaves of grasses or at the base of plants. Eggs hatch in1 to 2 weeks. Newly hatched larvae are pale green and move in a looping motion. Larvae are also active at night, feeding on host plants. During the day, they can be found under plant debris or in the top few inches ofthe soil. After completing six instars, larvae pupate just below the soil surface. Adults emerge in 1 to 2 weeks. A second generation occurs in late June or early July and a third in late August or early September. Since moths prefer dense vegetation for oviposition sites, armyworm infestations generally develop in areas such as grass pastures, roadsides, and along fence rows. 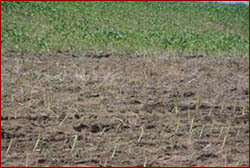 Oviposition sites often include weeds and grassy in weedy or reduced tillage fields. 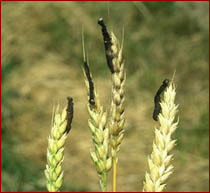 Consequently, these fields armyworms are often a problem in these fields. If a herbicide is used to control the weeds, larvae move from the dead grasses to the corn. As larvae run out of available food sources, they move to other host plants such as small grains and corn. This usually occurs during May and early June. Armyworms consume leaf tissue of corn plants. Feeding is usually confined to leaf margins, but in some instances, larvae may strip the plants entirely of leaf tissue. Corn generally recovers from damage caused by moderate infestations if the growing pointhas not been injured. Ordinarily armyworms that attack young corn migrate from small grains or grass fields. Injury caused by armyworms in forages is sometimes confused with that caused by other insects. 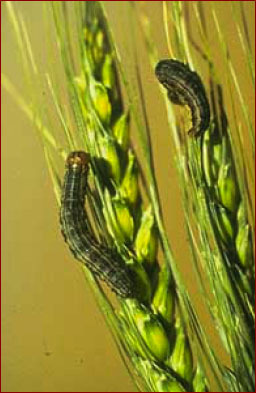 Armyworms do not attack pure stands of alfalfa and other legumes, but cutworms do feed on these crops. If the field is a grass-legume mixture, cutworms and armyworms may both be present. If it is a pure grass stand, the insects are probably armyworms. The damage is the same, however, as both eat the foliage. Oftentimes groundhogs, rabbits, mice, and other small animals will cut stems of plants into small sections and pile them up. All of the plants in a small area may be cut up into tiny sections. Many people mistake this for armyworm damage. Armyworms are often go unnoticed in fields until injury is severe. Larvae feed primarily at night and may cause damage before being detected. In corn: Examine 20 plants in five locations in a field for a total of 100 plants. Determine the percentage of damaged plants in the field. Also note the number of larvae found and estimate their size. On warm, sunny days, larvae may be found under plant residue or in the whorl of the corn plants. 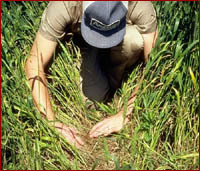 In cereal grains: Examine three linear feet of row in five or more areas of a field. Shake the plants vigorously and then look for armyworms on the ground and under debris. Estimate the size of the larvae and the percentage of plants damaged. Also note the stage of development of the plants. Scouting for armyworm larvae in wheat. Armyworm larvae. Diseased armyworm larvae on wheat heads. There are several species of armyworms that are present every year in the Midwest, however, economic infestation usually do not occur on an annual basis. The development of economically damaging populations depends on several factors, including, spring moth flights, cropping practices, weather conditions, natural enemies, and others. Most years, armyworm populations are kept below damaging levels by several predators, parasites, and pathogens. Diseased armyworm larvae on corn. Naturally occurring predators such as ground beetles and rove beetles may be important in keeping armyworm populations low each year. Research conducted by Michigan State University has found over 12 species of parasitic wasps and several flies that commonly attack armyworm larvae. Tachinid eggs on armyworm larvae. Tachinid flies, such as Nemosturimia rufopicta, lay eggs on the body of armyworm larvae. Eggs are usually deposited on the thorax near the head so the armyworm can bite them off. Parasitic wasps also parasitize armyworms. Cotesia marginiventris, a braconidwasp is one of the most common. The parasitoid, Glyphanteles militaris inserts as many as 60 eggs at a time and is known as a gregarious parasitoid since many larvae develop in one host. On the other hand, Meteorus communus lays only one egg per host (solitary parasitoid) and attacks second to fourth instar armyworms. There are several types of viruses, a microsporidium, and fungi that infect armyworm larvae. A cool and wet spring favors armyworm development while hindering parasite and predator populations. The risk of potential armyworm infestations can be minimized by control or elimination of grassy weeds in from fields or field borders. Not only will moth egg laying activity be reduced, but so will themigration of larvae into the field. Watch for movement of armyworms from grass or weedy areas to field borders. If armyworms move into fields and infest crop areas, and insecticide treatment may be necessary. 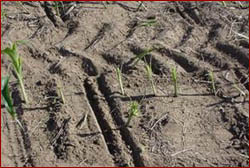 In seedling corn, control may be justified when 25% of the plants are being damaged. After pollen shed, insecticide control may be justified when feeding occurs above the ear level. In small grains, treat for armyworms when there are 6 or more non-parasitized larvae (¾ to 1 ¼ inches long) per linear foot or row before extensive head cutting occurs. 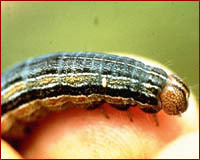 Mature larvae are approximately 1 ¼ to 1 ½ inches long. Armyworm larva complete six instars. The sixth instar requires about 7 days to complete development, depending on temperature. The sixth instar consumes about 80% of all the foliage eaten during larval development. Handbook of Corn Insects, Entomological Society of America.